View the Vallarta Weekly Ad Sale, valid April 17 – April 23, 2019. 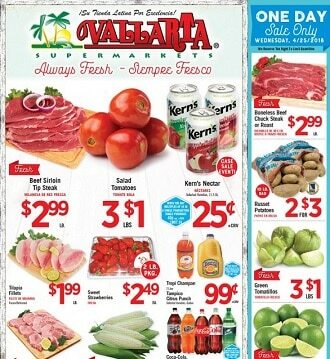 Save with this week Vallarta Ad Specials, Hispanic food offers and bakery & deli promotions. Start saving today and get low prices on kitchen essentials like fresh produce, fresh beef, general merchandise, tortilla, seafood, sweet white corn, extra virgin olive oil, hot tomato sauce, avocados, Navel oranges, green tomatillos, Anaheim or Serrano peppers, Ranchero Fresh Mexican Queso Fresco Cheese, Ranchero Chorizo, Red or Green Salsa.